Home / entertainment / Oman / Oman in the Western news Bingo card! Oman in the Western news Bingo card! 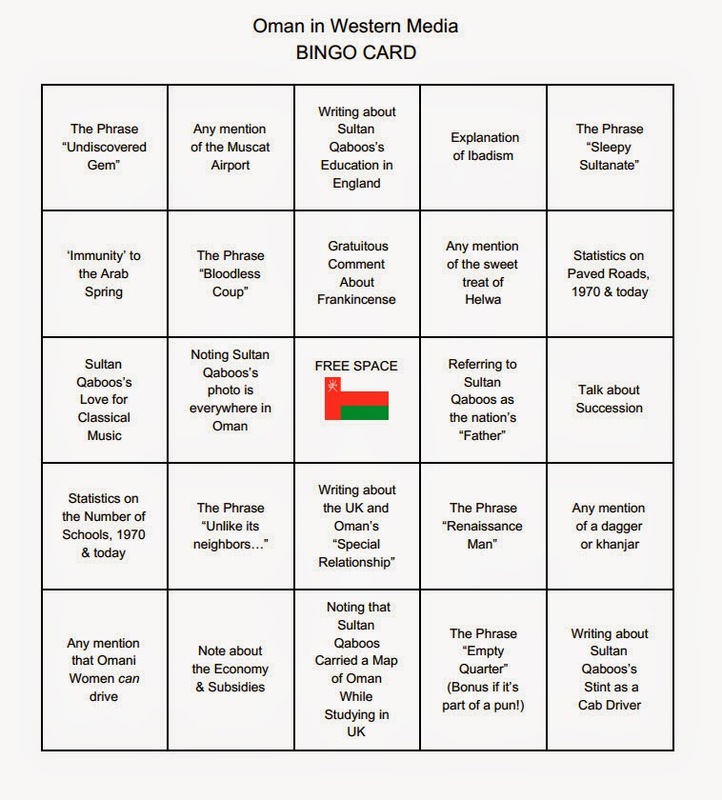 A very good friend of mine that used to live here, Stephanie, has come up with a pretty fun Bingo card to be used whenever Oman is featured in the Western news services. Its aimed mostly at journalists out there, but I found amusement with it too. After nearly 8 years in the Sultanate, I've lost count of the number of times its been referred to as the Sleepy Sultanate. I wonder who first coined that phrase? Given the fabulous news yesterday, I'm sure you'll get a chance to play Bingo with this card as the news is repeated around the world. Now, does anyone have any more stories about when HM did a stint as a taxi driver? Not sure about the taxi stories but they were rife in the old days. I remember playing golf on the old ROP course and seeing him pull up in his Merc 4x4 and watch everyone for a while. he used to drive around quite a lot and just see what was going on. And still holds true today. Never in any country I have lived in before have I seen such genuine love for a leader. There must have been great parties in Oman last night! MJD: Parties, red and white and green balloons, 3 dead from over-excited drifting in Mabaila..., and prayers. But for a taxi story, in Qurum in the very late 80s he saw a poor Omani guy and had talked with him I guess or one of his relatives? (HM didn't drive a taxi of course) The man couldn't afford to get married and his family house was in bad shape and suddenly there were two new houses gifted and a wedding held. Whether this is true or now remains a Qu'rum folktale. The TAXI driver Qaboos is a man from the interior who looks so much like Qaboos and usually drives (in the 70s to mid 90s)a toyota pick-up and now refuses to go out very often because people always ask favours of him;) and give him gifts and duas for Qaboos. It is a funny thing because I know his wife, and everybody used to think she was the secret wife of Qaboos, which was hilarious for her children;) who all joined the army. Yet nobady said anything because they wanted to protect "the secret wife and heirs" lol. Of course, the man is not qaboos, and is now a proud owner of a helwa making business;) and is an avid opera-hater. Big on drums, not big on violins. I heard numerous stories that HM was an undercover taxi driver in Salalah, and enjoyed hearing from ordinary Omanis about their lives, until he was in an accident and the ruse was up. Is that just folklore? It's such a great story!